Immediately following the devastating April 2015 earthquakes in Nepal the green pond behind was one of the only water sources available in the city of Kathmandu. You can see by the faces of the people their surprise when the ZOEN filter made the water drinkable. 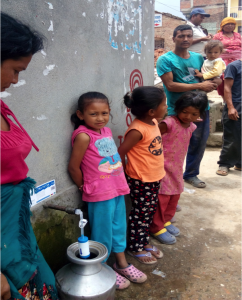 All social groupings were affected by the earthquakes, poor and wealthy residents of Kathmandu alike were accommodated in tents on city parks and initially had no clean drinking water. 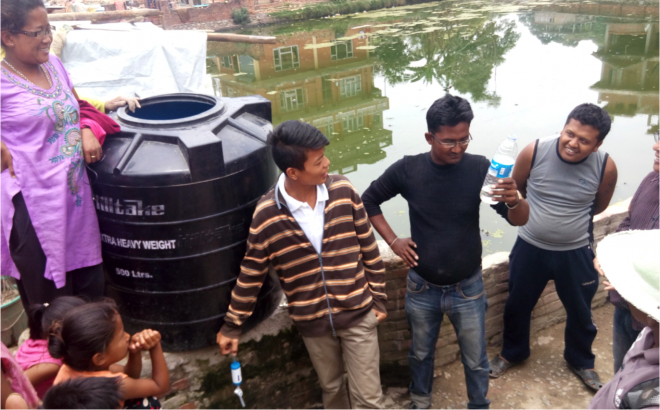 The Water Serve team gave demonstrations of the ZOEN filter 2 bucket system and provided residents with clean water from filter stations set up around the city. City mains were ruptured leaving the distributed water heavily contaminated. Large tanks of this contaminated water were set up around town, then cleaned and rendered potable by attaching a ZOEN filter. 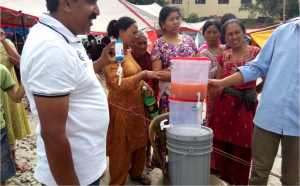 As Nepali communities recovered from the earthquakes, training was given in the region, in the use of the ZOEN filter to wives from various community groups. 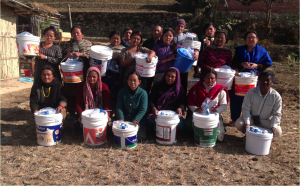 After the training, each woman that brought a clean bucket, received an installed filter for their home use. Each wife was strongly encouraged to share the drinking water with neighbors. 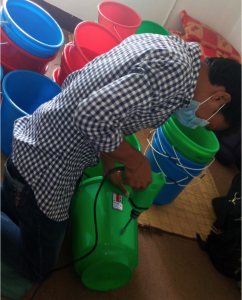 Churches were centers of distribution also and ZOEN filters were installed in buckets in large numbers, training was conducted then the bucket and filters given to people in the community that needed clean drinking water.